First I must mention there is nothing lacy or racy, as in a lace negligee Jilly Cooper style, to be seen in this post. 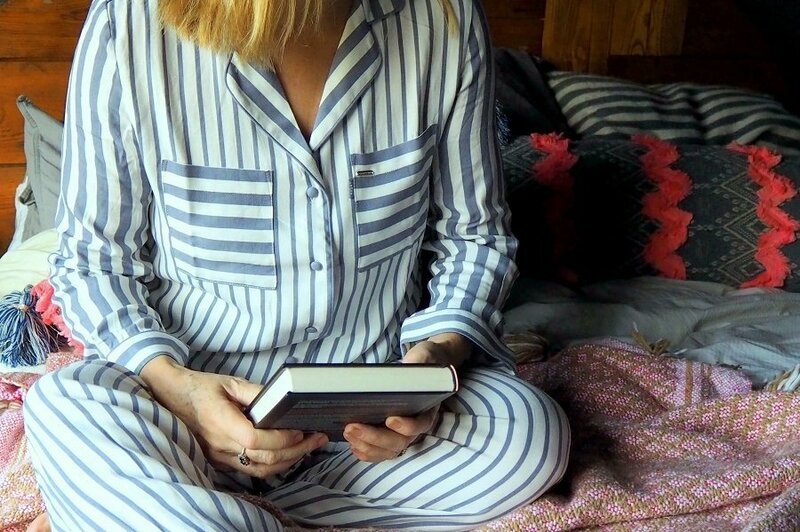 I can assure you this post is merely about what I am wearing in bed whilst tucked up with a book and a cuppa! Namely cosy Pyjamas. 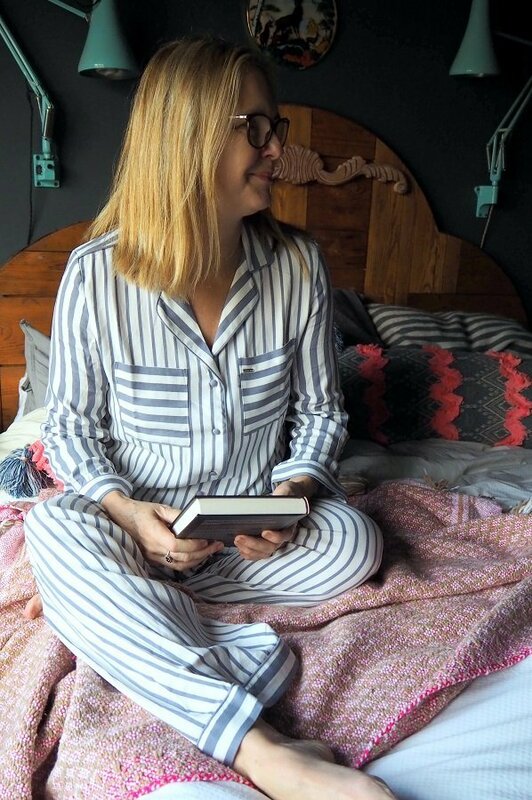 I can assure you this post is merely about what I am wearing in bed whilst tucked up with a book and a cuppa! So do tell me, what is your favorite nightwear attire? For myself I would always choose a nice pair of striped pyjamas and a cosy pair of slippers to go with. 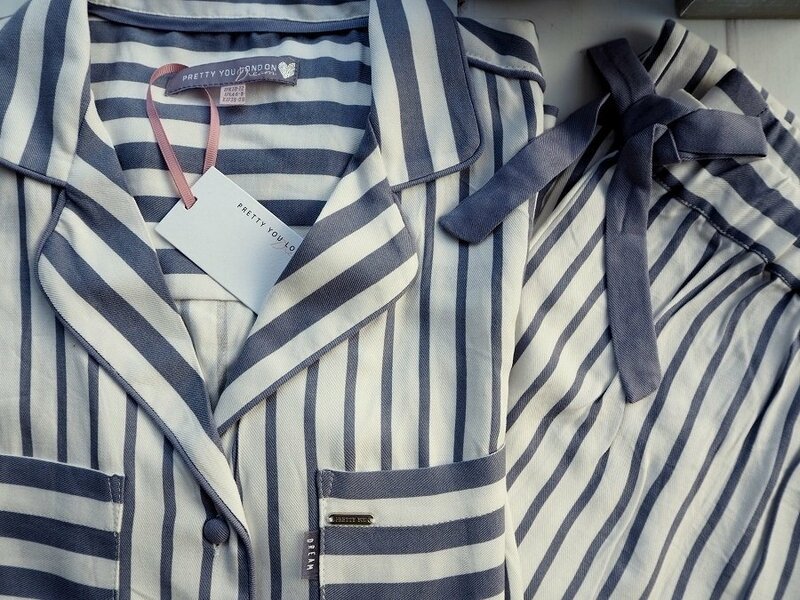 So when Pretty You London approached me with an offer of testing out their autumn winter collection of PJ’s and slippers that is exactly what I chose! 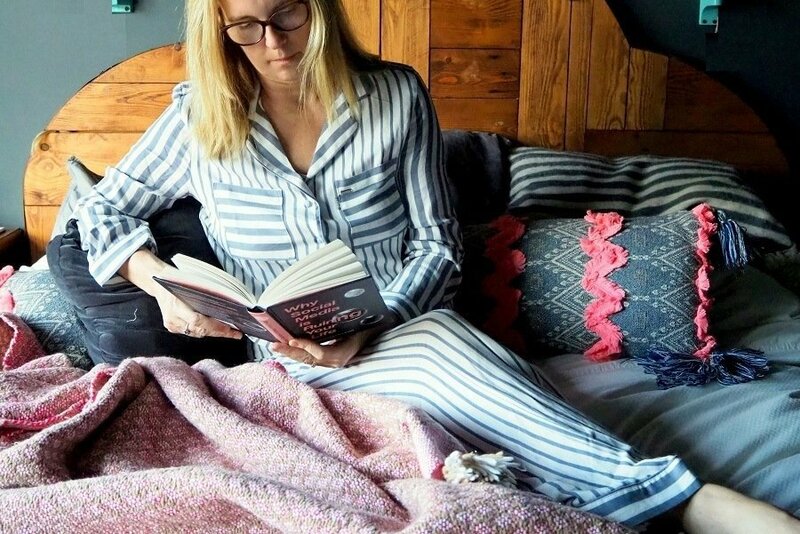 A note on sizing: In these pics I am wearing a size 10/12, as I usually take a 12 however, I would advise you to size up if you like your pj’s slightly loose fitting as I do… The length is perfect, the details are spot on and they are not too hot to wear in bed even for this 55 year old. I love a nice pair of striped pyjamas and a cosy pair of slippers! Women’s House Shoes: Britt in Charcoal. Pretty You London have a range of ‘House shoes’ like normal slippers but with a rubber sole. They have been so useful that I am claiming them as my discovery of the year. Normal slippers do not allow you to go to the dustbin when it’s wet, or peg the washing out in summer, you have to change your slippers to go outside. These pretty house shoes allow you to trot in and out without getting soggy feet. Marvelous news for this dog owner. 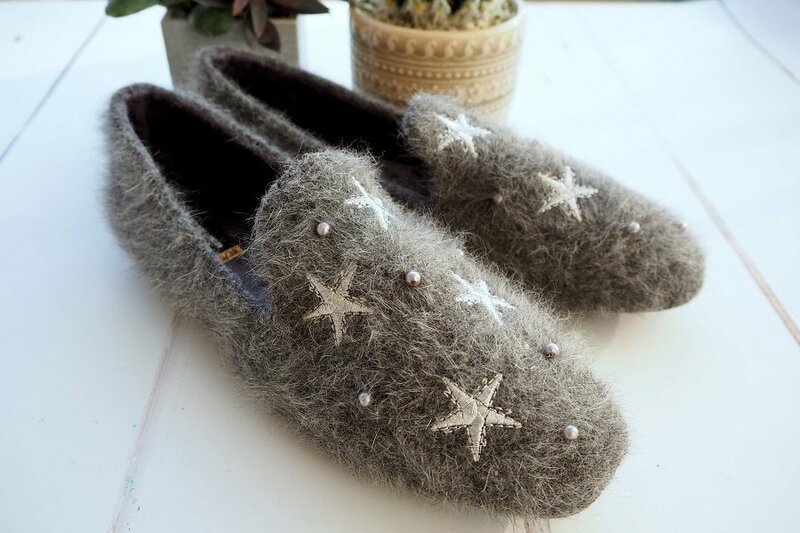 They are so pretty, decorated with embroidered stars and pearly beads. They come true to size and are paddede and cosy to wear. These pretty house shoes allow you to trot in and out without getting soggy feet. Now you know what I am wearing in bed this winter it’s a thumbs up from me, I love my new slippers and pyjamas. These pyjamas and slippers were a gift from Pretty You London. Just voted for you and a fairly new reader- really enjoying your posts! Thank you so much for the vote and your lovely comment. Both very much appreciated! Love those PJ’s. 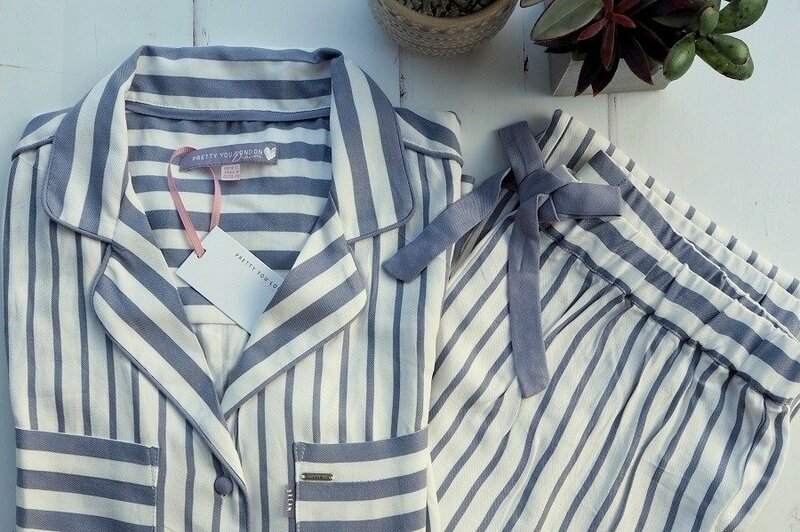 I had a dressing gown years ago in a beautiful cotton, the same stripe, from Laura Ashley. They look really good quality. Also love the house shoes, as you mentioned in reality we are in and out of the house all day long, and nothing worse than soggy slippers! Hiya Alison! They are not cheap but I think quality lasts? When we were growing up we only had new clothes when we grew out of them right? Not every eason when the colours changed. Today it is so different, so I am going back to quality and mending all my clothes…. Those house shoes would be perfect for me as I never walk in the house on normal shoes! Nice cosy pyjama!